Skunkboy Blog: Happy Birthday, Poe! Happy Birthday Little Poesy! I can't believe it's already been a year. Oh my goodness... she is seriously the cutest thing ever! Happy birthday baby Poesy! Happy Birthday Poesy! I love her dress and crown! Wow! A year! Happy Birthday to your little girl! Time flies when your having fun! Happy birthday, bon anniversaire, and zum Geburtstag to Poesy! Have a lovely day filled with nothing less than smiles and sunshine! Happy birthday Poe! Is she really 1 already? Time flies! I think it was Poesy that invented the therm 'death by cute'. She is such a cutie! That is the most darling picture. Happy birthday sweet baby cakes...you are SO loved. I saw these the other day (and of course had to but one for myself) I'm sure you could make some yourself, but I saw your photo and had to share! Happy Birthday, lil princess! First birthday has to be special. Happy Birthday, Cute Little Poesy! oh how wonderful! happy happy day, poe! Aww happy birthday little Poe! she is such a sweet little pumpkin! happy first birthday, Poesy!!! Happy Birthday Poesy, you little cutie! Katie, she is the most adorable little one I have ever ever seen. Have a lovely day. happy birthday to your sweet, sweet baby girl! That little crown is possibly the most adorable thing I've ever seen! She is so adorable, happy birthday to your little girl! happy birthday sweet girl! love the dress. happy birthday beautiful little poesy! what a cutie! happy birthday pretty girl! AWWWW!!! Happy Birthday, Poe!!! I hope your first birthday is full of love, happiness, good luck and loads and loads of whimsy and magick!!! happy birthday to your cute gal!! super sweet picture! Congrats to the little one. Hope you had a great party!! Happy birthday, Little Miss Poe! And congratulations on all the amazing things you have already achieved in your very first year! 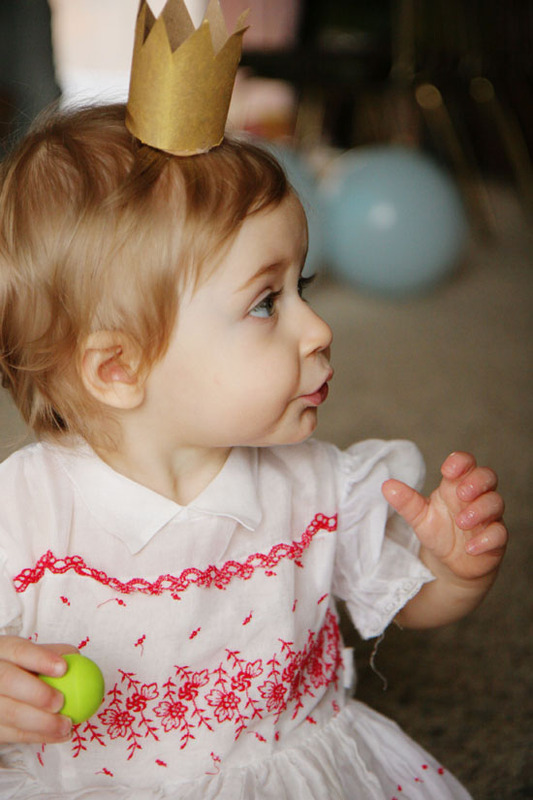 I love all the pretty pictures from pretty little Poe's first birthday. :) You did a fabulous job! aww your little one is so precious & looks like a great party, love the little decorations & esp that you used "normal" items. Too bad about the adorable crown, but ya never know w/ little ones it seems. Glad it was a special day for all, happy late birthday Poe! Believe That Everything is Possible.